Detailed review of Designcrowd, a crowdsourcing design site that can help you with logo design, website design, banners and more. Easily compare with alternatives. If you are looking to complete a graphic design project, one option is DesignCrowd, a website which offers a wide variety of design types and styles. Through the platform, you can run a “One Designer” project (in which you are matched with a curated designer from the site’s pool), a freelance job (in which you can choose and hire a freelance designer but use the company interface to communicate and pay), or a design contest (in which you start a competition and multiple designers submit designs). While the first two options are similar to traditional design firms, the crowdsourced contest can offer a lot more diversity and creativity to choose from. 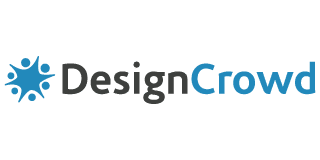 DesignCrowd is a private Australian company launched in January 2008 by Alec Lync and Adam Arbolino. Both founders are IT guys, not designers, but they used their expertise in technology to create a space where designers can connect with clients. Today, their site is home to 616,993 designers from 165 countries around the world, and they have processed over $45 million of business through their design projects and contests. Write a brief—The brief on DesignCrowd is the shortest one we saw while testing out different sites. You will have to put in a project name and description, choose a duration (2, 5, 10, or 15 days), put in your logo text, and upload any files or images you want to offer your designers as inspiration. Then you pick your package, add any upgrades you want, and pay. That’s literally it. Receive design submissions—Once you submit your brief, your contest is open, and you will start receiving submissions, possibly within hours. The higher your prize, the more responses you will get, generally speaking. During this phase, only you will be able to see all the proposed designs. Choose your winner—Within 31 days from the moment your contest has been closed, you will need to choose a winner. At that point, you can communicate with the designers through the site in order to request any adjustments to the design. When you are happy, you can approve the final design, and you will receive the files and copyrights (file types will vary depending on the design category). The moneyback guarantee is not 100%, as you will forfeit several fees even if you are not happy with the results. Overall, our DesignCrowd review is a positive one. The number of designers alone represents a huge benefit, giving you access to more talent and faster responses as a client. They offer a broad spectrum of design types, and you also have the option to choose to work one-on-one with a designer instead of holding a contest. The prices are also a draw as it gives you more options than many other similar sites. It is important to note that the cheapest packages have limited numbers of designers and revisions, but they do offer an alternative for limited budgets. If you choose to go with their most basic packages, you probably won’t get very many submissions, but you are guaranteed to get some, and it’s nice to have that option if your budget is tight. The only big drawback is how short the brief process is, relying almost exclusively on you describing what you want. For those who don’t already have a clear idea of what they’re looking for, other sites which offer more interactive briefs may be a better fit. We needed a logo and business cards for a our new business but did not want to spend a lot of money. We found Design Crowd on the internet and decided to give it a go. We thought we would start with a logo to see what we get, to our surprise we received great designs and over the course of only two days picked a fantastic design for under $220! We then asked the same designer to work on the business card, another great job.Thank you DesignCrowd and our designer, we highly recommend this service. Good clean design. Very responsive designer. Keen to assist in every way. Will definitely use again. Designcrowd comes up with the goods again! Just a very positive outcome for both businesses i have owned with the winning designers presenting innovative, simple & clear designs that make you say YES that is it. I was looking around for a long time for a place to get my logo designed and they were always expensive and would only give you 2 or 3 options. With Design Crowd I was able to choose from almost 200 designs and really liked many of them. Made it hard to choose but ended up with the best one….I think….LOL Thank you very much for this amazing service. Lots of creative and interesting designs submitted and most designers willing to revise to notes. Over all, an excellent experience.